This year I’m celebrating an anniversary of sorts. A notification that makes me feel good about my life as a caregiver and a capable, mature adult. I’m talking about, of course, my plant. The Saturn plant. Happy 10th anniversary, chlorophyll wonder! 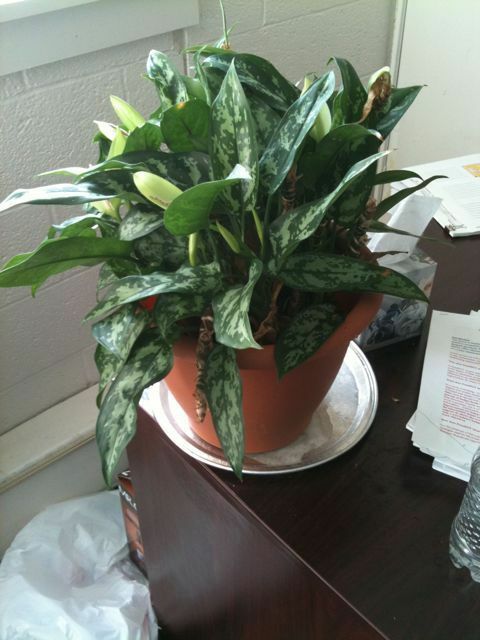 The plant was a gift, part of the customer service of the Saturn car dealer when we purchased our first new car. It was only about 8″ high, with about five or six leaves. The plant became my cubicle buddy aty job in Lancaster, and when I moved on, it occupied a spot on the Wurlitzer in the living room until I started my current job. Over the years it grew, needing new pots and fresh soil from time to time. But the significant thing here is that I’ve been the sole keeper of this plant. And it has survived. There have been plants in the house that have survived too, but usually through a joint effort on my wife’s and my part. The Saturn plant has, to date, been the longest lived thing in my care. It’s also interesting that both the Saturn brand and the Wurlitzer it called home are both gone, and the plant remains. Here’s to you, Saturn plant. Let’s go for ten more!